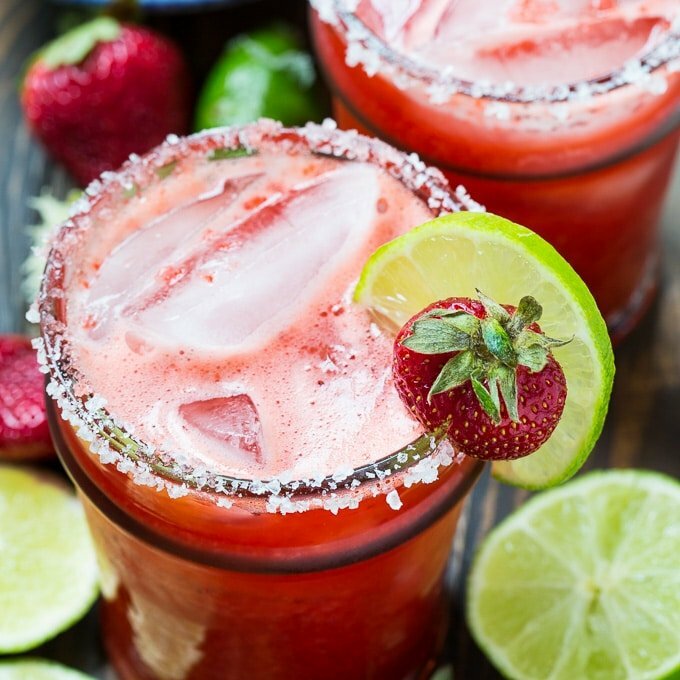 Homemade Strawberry Margaritas made from fresh strawberries, lime juice, agave, tequila, and Triple Sec make a cool and refreshing cocktail that’s perfect for getting a spring or summer weekend started. 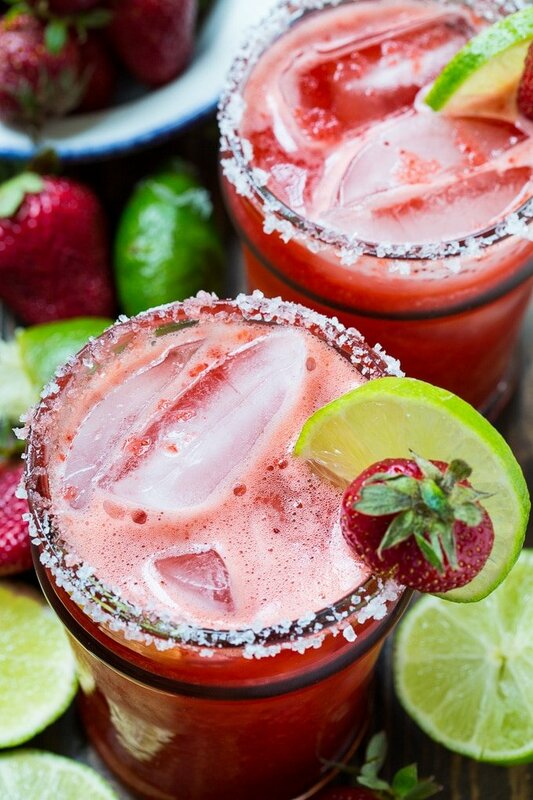 These Fresh Strawberry Margaritas have plenty of strawberry flavor and a gorgeous color. They have plenty of sweetness, but they’re not overly sweet. They’re made from all-natural ingredients and they taste so much better than a Margarita made from a mix. Definitely worth the few extra minutes it takes to make them. Tip: Make the strawberry puree and squeeze the lime juice the night before. Then you can have your 5 o’clock cocktail ready in no time at all. To make limes super easy to squeeze, microwave them for a few seconds. This will really get the juices flowing. 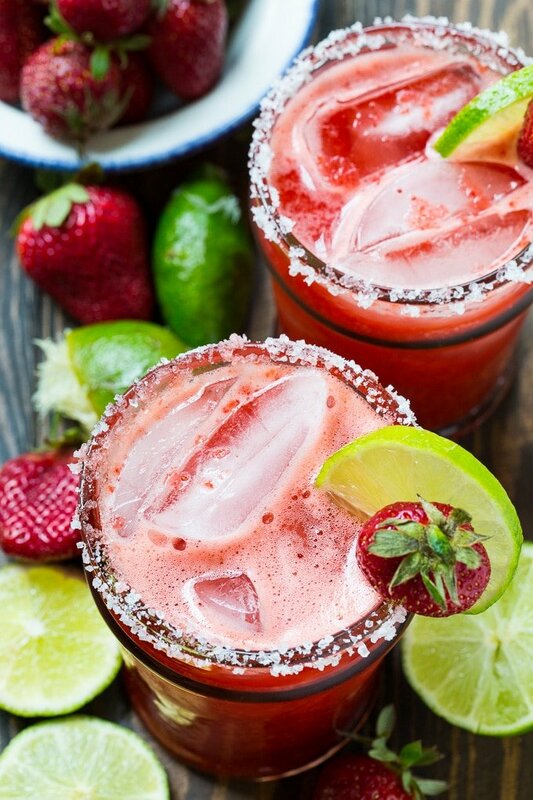 Homemade Strawberry Margaritas made from fresh strawberries, lime juice, agave, tequila, and Triple Sec make a cool and refreshing cocktail that's perfect for getting a spring or summer weekend started. Place strawberries in a blender and blend until smooth. Pour through a fine-meshed sieve, using a spoon to push all the liquid through. You want at least 1 cup of juice. Place all ingredients in the blender and blend to mix well. If you want frozen margaritas, add some ice. Run a lime wedge around the glass rims. Pour some salt onto a saucer and dip the glass rims into it. Fill glasses with ice and Margarita mixture. Note: I use Patron Silver Tequila for Margaritas. This entry was posted in Cocktails and tagged strawberries, tequila. Bookmark the permalink. Could you please tell me what agave is. Thanks so mucb. It is a sweetner that comes in liquid form. You should be able to find it with the sugar at your local grocery store. Now this looks amazing! Wouldn’t mind one right now!